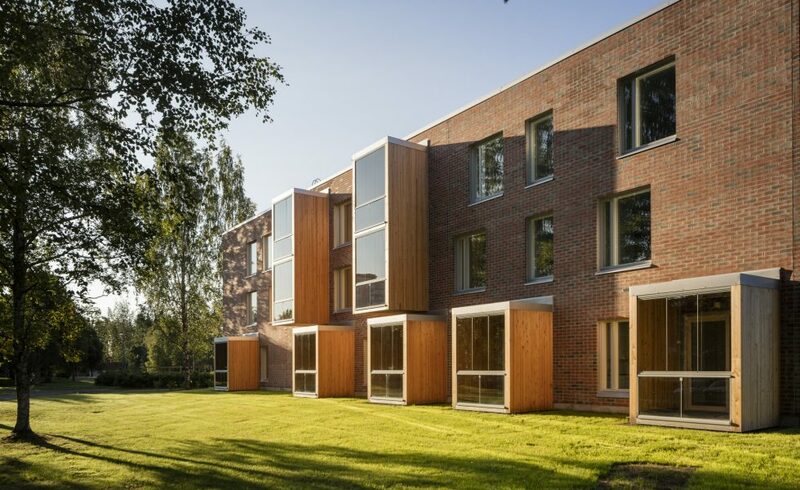 Risuviita in the Kasperi neighborhood in Seinäjoki offers a combination of social housing and special housing for people with autism spectrum. Completed in the fall of 2017, it has been warmly welcomed by its new residents who have made it their home and settled in over the past few months. The new residential block for Autism Spectre in Kasperi is located at the intersection of two park axis. The new building takes its place in dialogue with the surrounding parkland and views in with the rest of the neighborhood’s built structure forming a focal point at the end of the long vista over the park. With the nine apartments serving residents with autism spectrum located in the same building with the rental apartments providing social housing, Risuviita offers a combination of varied forms of living in a balanced mix. However, the different types of apartments are functionally separated from each other. The nine apartments that are intended for people with autism spectrum are placed on the first floor of the building facing the sheltered inner yard. The rental apartments are placed in the floors above the apartments for people with autism spectre as well as next to them in a way that allows both types of living to each have its own yard. The part with the apartments for people with autism spectre is composed of three units: one larger unit of four apartments with spaces for the staff working there as well as shared spaces for dining, cooking and informal social gathering, and two smaller units that offer opportunities for more private and independent living. The character of the spaces gradually changes from more public to more private. The challenges of social interaction and communication have been carefully taken into consideration in the design. As a whole, the entity offers an opportunity for social interaction while respecting the individual needs and motivation of each of the residents. 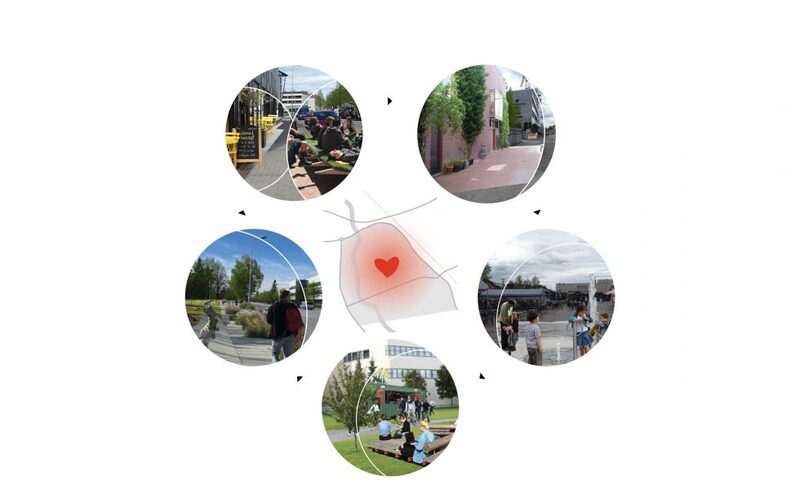 The shared spaces are designed in such a way that they can easily be altered and transformed according to need and offer opportunities for a variety of uses. Apartments on the ground floor have direct access to the yard through individual porches of their own. The porches serve both as an entrance as well as as a terrace. On the higher floors each of the apartments has a balcony of its own. The living room spaces are arranged around the balcony or terrace in such a way as to allow for the light to enter differently into the room according to the natural rhythm of the day and light. We are glad to announce that Suvela Chapel by OOPEAA is one of the finalists for the Archdaily 2018 Building of the Year Awards. Suvela Chapel was selected by Archdaily readers and architecture enthusiast from all over the world amongst 3,000 other projects, narrowing down the list to 5 finalists per category. Suvela Chapel has been selected as one of the finalists in the Religious Architecture category. Now, you can vote Suvela Chapel and make it Archdaily Building of the Year by following this link: https://boty.archdaily.com/us/2018/candidates/107731/suvela-chapel-slash-oopeaa Vote now and share the link! Archdaily is a world-known online platform for architecture that has become an invaluable resource for architects and designers, with over 500,000 daily visits. Puukuokka Two has now been completed and the residents have already moved in. Puukuokka Three is under construction and will be ready for the residents to move in in June 2018. With them joining Puukuokka One, finished in 2015, the entire Puukuokka Housing Block will be complete in June 2018. 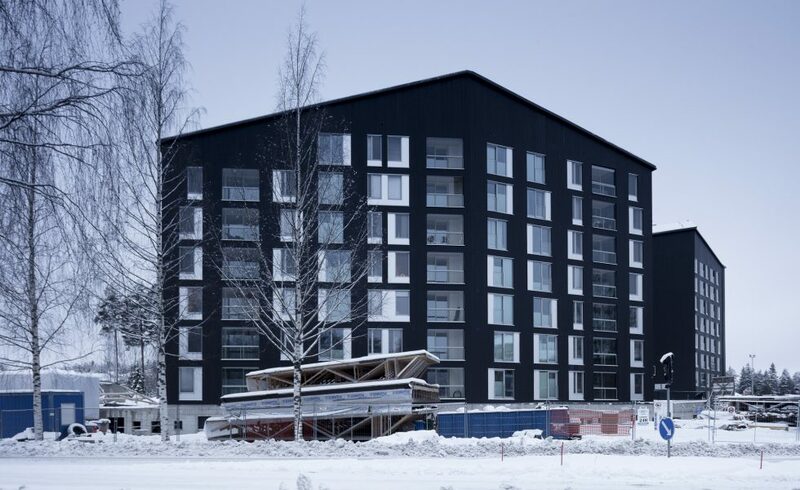 Completed in the spring of 2015, Puukuokka One was the first eight-story high wooden apartment building in Finland. The entire load bearing structure and frame of the Puukuokka buildings is made of massive wood and composed of prefabricated volumetric CLT modules. Each apartment is composed of two modules, one housing the living room, the balcony and the bedroom, the other housing the bathroom, the kitchen and the foyer area. The piping for heat, water, electricity and ventilation is integrated in the wall structure in the hallway allowing for an efficient organization of the plan and making it possible to maximize the space allotted for each apartment. 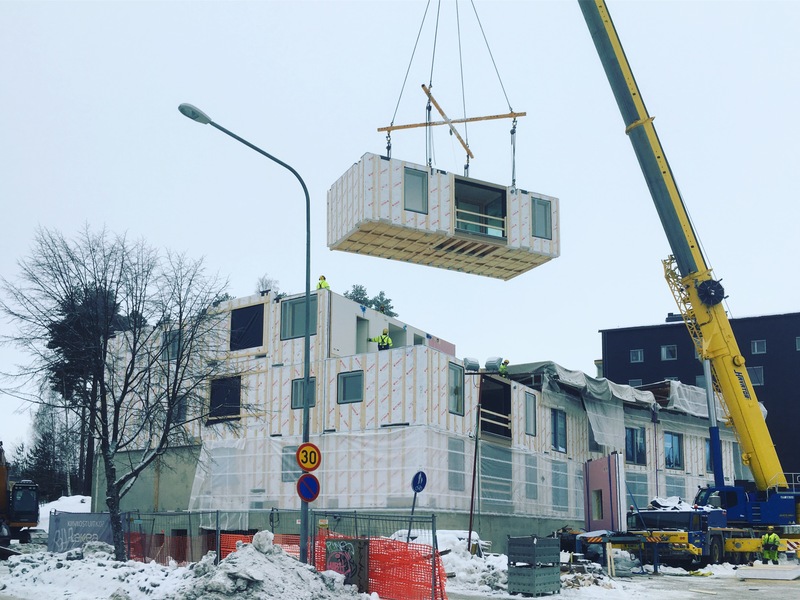 Puukuokka explores the potential of modular prefabricated CLT construction to provide environmentally responsible and affordable housing of high quality. It pilots an innovative lease-to-own financing strategy that aims to support social sustainability by promoting stable communities. With 58 units in Puukuokka One, 70 in Puukuokka Two and 56 in Puukuokka Three, ranging from studios to three bedroom apartments, the entire complex offers homes for 184 households from single dwellers of all ages to families with children. 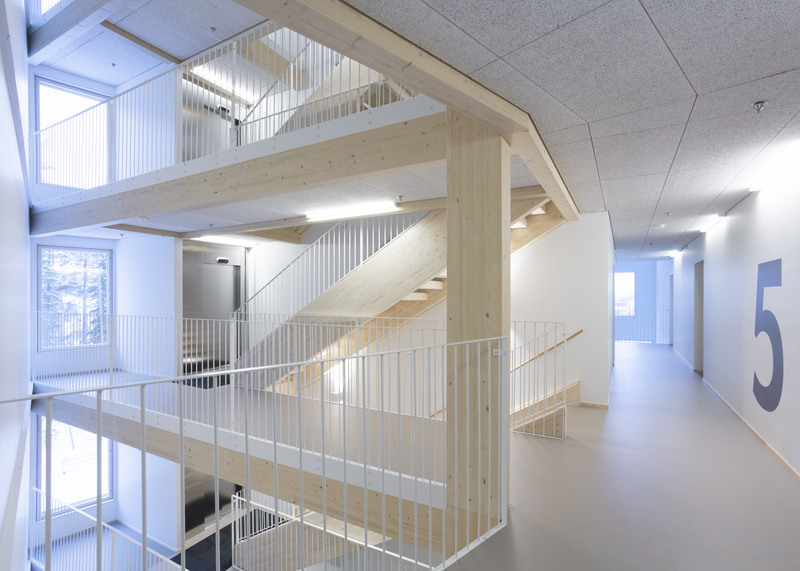 In Puukuokka, the goal was to find a solution that makes the best possible use of the technical and aesthetic qualities of CLT and to create a wooden building in large scale with a distinct architectonic expression of its own. The goal was to create a building complex that combines the sense of privacy of single-family dwellings with the semi-public character of the shared spaces of an apartment building. The vision is to provide the residents with a functional space rich in experiential qualities. 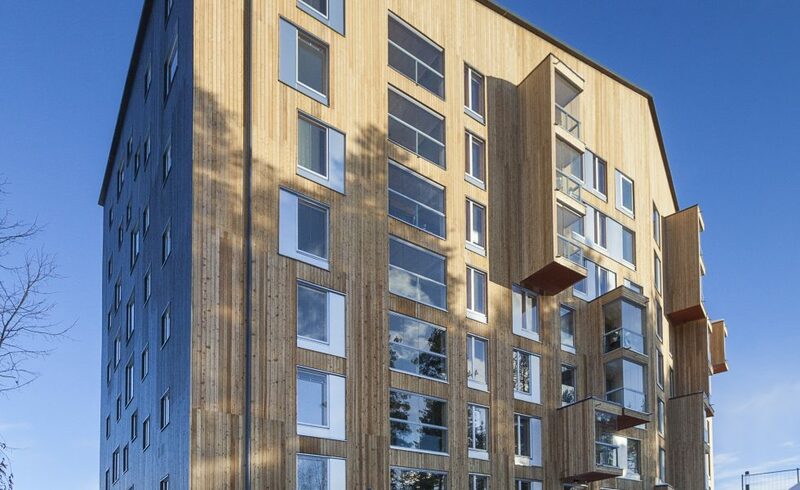 Commissioned and built by Lakea, and developed in collaboration with Stora Enso, Puukuokka is an energy-efficient and ecological trio of multi-story wood-framed apartment buildings in the Jyväskylä suburb of Kuokkala. The town plan created in collaboration with the City of Jyväskylä has been specifically tailored to meet the needs of the building complex. The CLT modules are prefabricated in a local factory in Hartola less than two hours away from the site of Puukuokka. The use of prefabricated modules has made it possible to cut the construction time on site down to six months per building and to reduce the exposure to weather conditions. 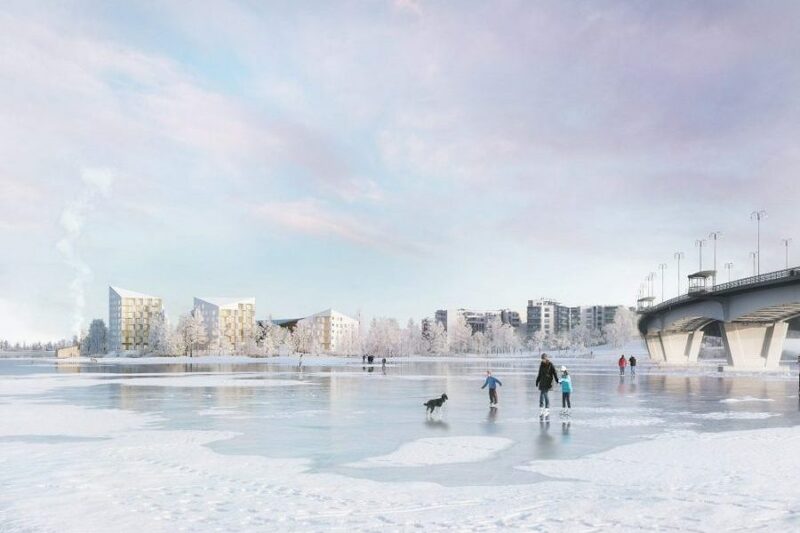 OOPEAA’s entry, Käpälä (the Paw) wins the invited architecture competition for creating a residential neighborhood in the Suuruspää area by the Jyväsjärvi Lake in Jyväskylä. The competition was organized by Peab Oy in collaboration with the Association of Mother and Child Homes and Shelters of Middle-Finland and the City of Jyväskylä. The aim of the competition was to create a plan and design for a new residential area of high architectural quality with a strong identity in a highly visible place by the lakeshore in a way that respects the special character of the landscape and nature of the area while also providing an interesting element in the urban identity of the city. The winning competition entry by OOPEAA, Käpälä, the Paw, proposes a combination of three-story buildings and up to eight stories high taller buildings arranged in a free from arrangement in such a way as to allow for views to the lake and to the southern exposure from each of the buildings.The shapes of the buildings with their diagonally angled faceted roofs depart markedly from those of the rest of the Kuokkala Shore. With their overall light color appearance they form a recognizable and unique silhouette. 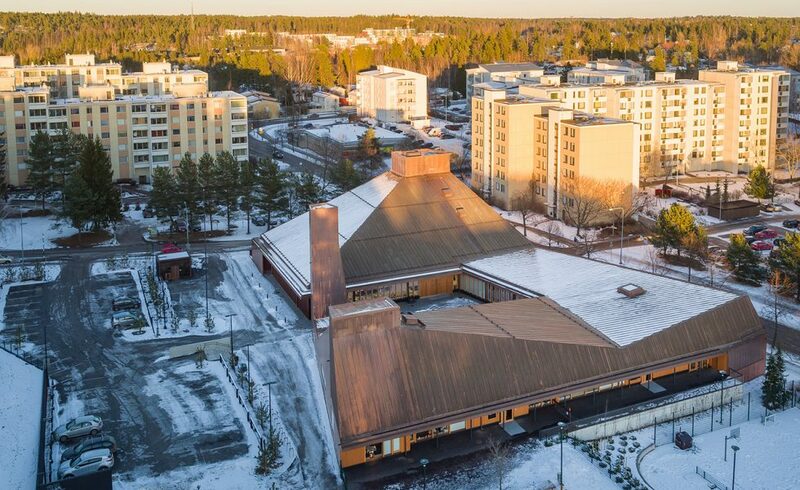 The National Arts Council for Architecture and Design in Finland has chosen to grant the State Prize for Architecture to Anssi Lassila in recognition of his unconditional strive to achieve the highest possible quality in his work and for his uncompromising ambition to create a better environment for life. In their award statement the members of the Arts Council note that while Lassila is especially known for his skillful work with wood, his architecture is characterized by versatility and an openness for working creatively with different materials as best suited for addressing each individual assignment. While Lassila’s work reflects a respect for tradition and an understanding of traditional methods, his architectural expression is innovative, open-minded and fresh. In his buildings a strong sense of sculptural form is joined with deep knowledge of tradition. The granting ceremony was held today at Smolna, the banquet hall of the Cabinet of Finland, and the prize was awarded by the Minister of Culture and Sports, Sampo Terho. In addition to the state prize for architecture, also the state prizes for design, fine arts, illustration, media arts, cinema arts and photography as well as the Art Moves People award were given out at the ceremony. The National Arts Councils operate under the Arts Promotion Centre Finland (Taike). State prizes are awarded annually by the seven national arts councils. State prizes can be awarded to an artist or a group of two or more artists in recognition of a work or performance in a specific art form that has been completed within the last three years and is of especially high artistic merit. State prizes can also be awarded to artists for their long-term valuable work for the benefit of a specific art form. In addition, state prizes can be awarded to art associations or other communities. The Arts Promotion Centre Finland (Taike) is an expert and service agency for promoting the arts. Taike together with its arts councils and boards awards grants to professional artists and subsidies to communities in the field of the arts. Annually, Taike allocates 34 million euros as grants and subsidies. For a news release by the National Arts Councils, see here. Anssi Lassila is one of the keynote speakers at the 9th Annual Symposium of Architectural Research 2017 in Oulu. The other keynote speakers are Christian Nielsen, Ph.D., Professor at Aalborg University in Denmark and director of research at Business Model Design Center (BMDC), Miguel Á. García-Fuentes, MSc Arch., European Project Coordinator at the Energy Division of CARTIF Technology Centre, and Associate Professor at the University of Valladolid, and Rune Nielsen, Ph.D, co-founder and partner of the design practice Kollision, Interaction Designer. In addition, Helmi Ben Hmida, IoT expert & Digital Transformation expert, senior researcher and project manager in the Smart Living competence center in the Fraunhofer Institute Germany, gives a presentation as a special event speaker. The Symposium is an annual forum for research in architecture, urban design and planning. It has been organized by the Finnish schools of architecture together with the Finnish Association of Architects SAFA since 2009. The main mission of Atut2017 is to gather together experts from around the world to provide contributions for the research and development of smart cities and architecture. The main theme of Atut2017 is ”Plan, Develop, Design: Making Smart Cities and Architecture”. The Symposium aims to contribute to as well as critique and address a broad array of issues related to smart development and smart practices in architecture, design and lighting ranging from smart cities and communities to smart environments. The world is urbanizing and digitalizing, and cities, communities and buildings are being developed as smart environments. This raises a variety of new questions to be addressed for planners, designers and developers. Symposium aims to examine in what ways architectural design as well as urban planning and design can contribute to and address the smart city phenomenon and its practices and projects. It explores what kinds of integrative processes and methods may be used to connect development actions in smart cities, communities, environments, architecture and construction and how multidisciplinarity could benefit research, design and planning. It is a forum for researchers and practitioners in architecture, urban design and planning, as well as any other fields affiliated to planning, development and design of smart cities such as social sciences such as geography, cultural anthropology, interaction and communication studies. The CNN Style section highlights twelve buildings that transformed cities around the world in its review of Phaidon’s newly published book Destination Architecture. The new book by Phaidon presents a selection of one thousand of the most compelling designs from this period, and the review by Matthew Whitehouse in the CNN Style section highlights twelve of them as some of the world’s most fascinating buildings. 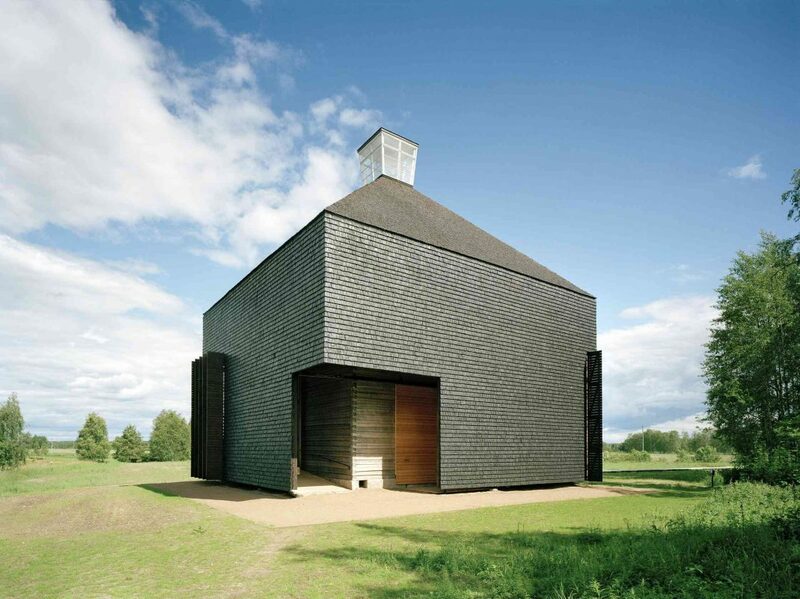 Two buildings designed by Anssi Lassila / OOPEAA are among the twelve: the Suvela Chapel and the Kärsämäki Church. Presenting examples from all around the world from nations as diverse as Mexico, Denmark, China and the United States, the book aims to become a unique resource for enjoying examples of contemporary built culture. It offers a rich overview of remarkable architecture of this time form well-known landmarks and hidden gems, from the world’s tallest skyscrapers, to the most intimate places of worship. For the full review in the CNN Style section on architecture, see here. For more info on the Destination Architecture by Phaidon, see here. For more on the Suvela Chapel, see here. For more on the Kärsämäki Church, see here. The city of Seinäjoki has commissioned OOPEAA to create a strategic preplan for the Seinäjoki Center around the train station. The plan, AsemanInto, a Gate to the City, is to create a framework that can serve as a guideline for developing the city of Seinäjoki in as a dynamic and thriving center of activity for the larger area around the city in people centered manner. It takes the area around the train station with its role as connecting the city with the larger area around it and with the rest of the country as a central focus and places it at the center of the developing city creating a clear and fuctional system of connecting lines between the station and the rest of the city. The basic urban strucutre of Seinäjoki is fascinatingly efficient. The train network brings people form near and far right into the middle of the developing city and the layout of the city offers ample opportunities for further developement and densification. As the city grows more dense and there will be more residents living in the center of the city, the area around the Seinäjoki Train Station will form an important part of the developing city center. The development of the area around the station will give a new direction and a new expression to the entire city. The area around the station along with the Travel Center will form an essential core to development of the entire city and they will be instrumental in addressing questions regarding access and accessibility in the city. The plan for the area is based on creating a clear continuum of block in which multiple different functions coexist and mix. It forms a rhythm in the urban structure creating open public spaces at the end of streets. The most important of these open public spaces is the central square by the station, which also serves as a central point of connection between the Kalevankatu street, the Aalto Cultural Center and the station. It has the potential to serve as a central starting and end point for the pedestrian center in the city. As an open urban public space it offers a gathering place with the restaurants serving the food province as well as a station for city bikes for rent. The square plays in important role as a central gathering place as well as as a route to the functions and premises in the surrounding city blocks. For a full description of the plan, see here. 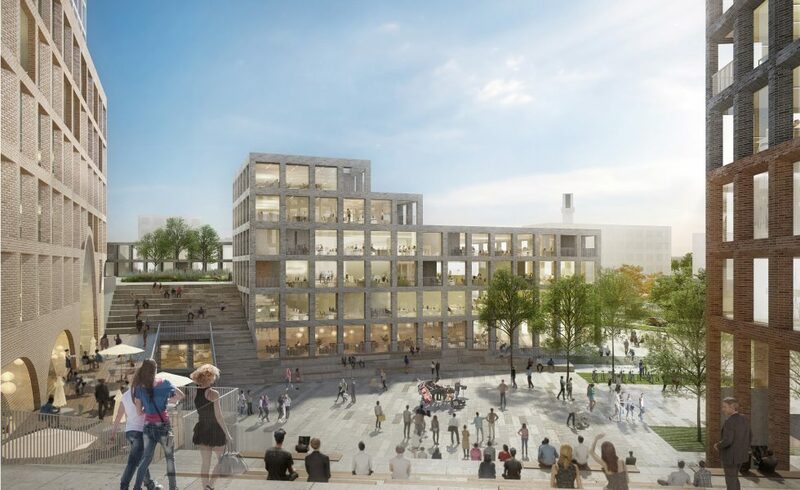 The City of Seinäjoki has commissioned OOPEAA in collaboration with Gehl – Copenhagen to work on a plan to provide a framework for the future development of the Seinäjoki Centre. 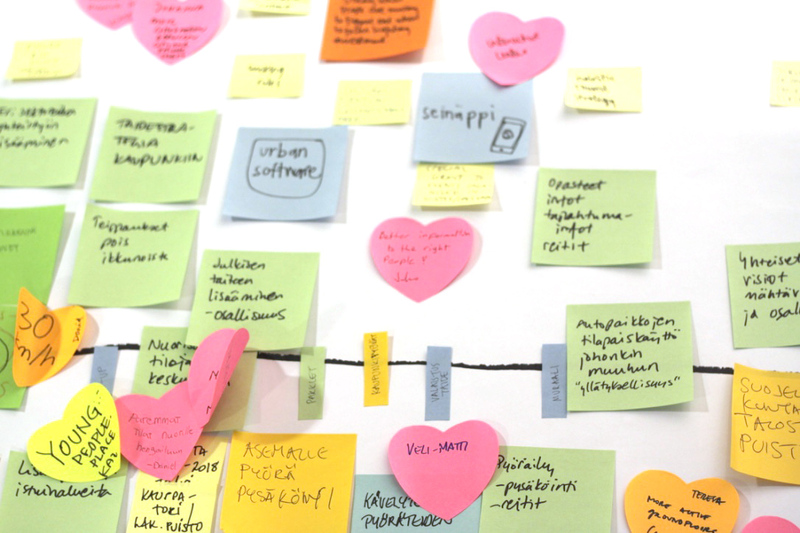 As the first part of creating a vision for the future of the Seinäjoki Centre, OOPEAA is working on an analysis of the current challenges and future potential of the area through a set of participatory workshops together with representatives of the city. The analysis will be ready at the end of the year and it will provide the foundation for future work on the vision to continue next year. The aim is to create a master plan for the central parts of Seinäjoki and a set of guidelines for the development of the city in the long run. The vision puts people at the center of the planning work. The goal is to create a livable and sustainable city that provides a good framework for quality of life for the citizens of Seinäjoki. OOPEAA brings to the project its expertise and vision in shaping sustainable buildings and urban environments, while Gehl Architects, a world-leading consultant in integrated urban solutions for making “cities for people”, will share its tools for activating urban life through innovative, participatory and people centered spatial solutions. 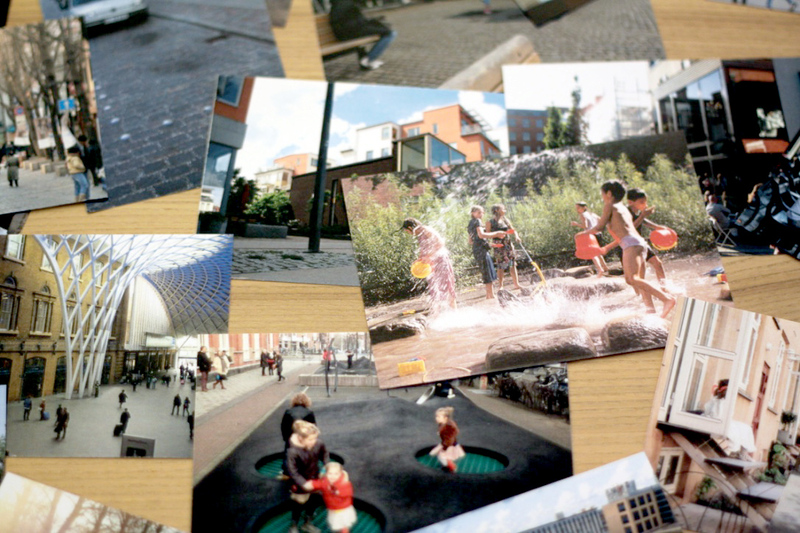 As part of the project there will be a series of workshops organized with the goal of facilitating the creation of a common vision for Seinäjoki city centre through an open dialogue involving the different stakeholders in a shared process. The first workshop between OOPEAA, Gehl and representative of the City of Seinäjoki took place on November 13, 2017. 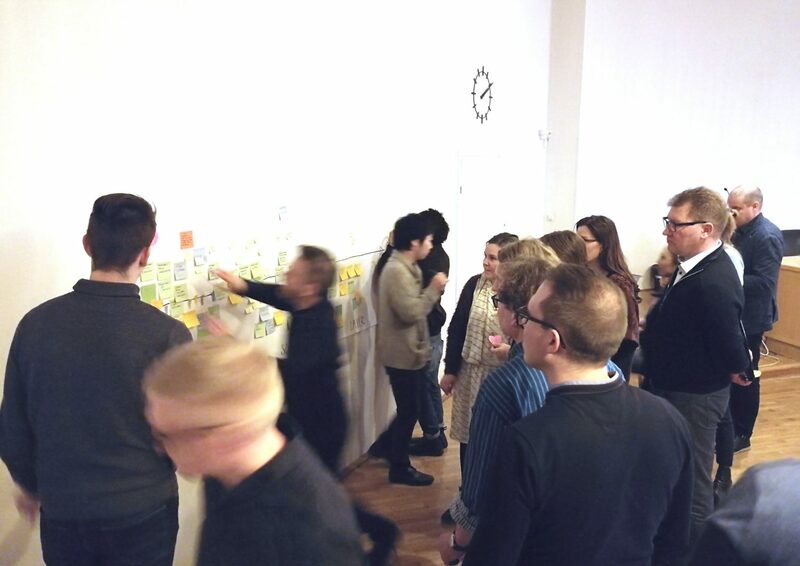 The carefully prepared workshop provided a great occasion to meet, discuss and share ideas and envision tools for developing the future of Seinäjoki city centre together. 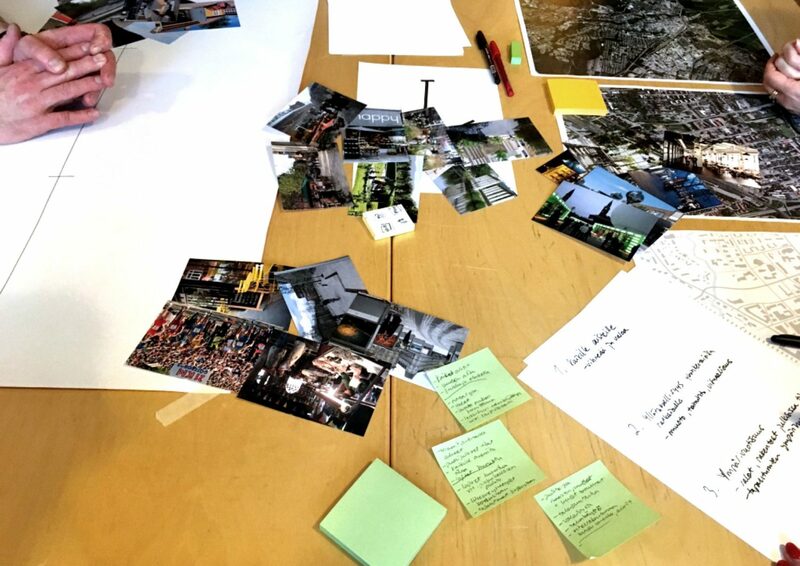 After introductory presentations by Anssi Lassila of OOPEAA and David Sim of Gehl People, the participants worked in groups on envisioning ideas for the future development of Seinäjoki and creating an action plan with actions to be implemented in the short term, medium term and long term. Some key themes that arose from the discussion were about integrating light and art in the city environment, providing more opportunities for activities in order to create an “all-year city”, balancing transport modes through prioritization of bicycles, and creating a new approach to provide diversity in housing and integrating green elements and cozy living spaces in the public spaces of the city. As a common thread in all proposals there was a positive attitude towards the city. While it was noted that in the long term Seinäjoki needs more flexible housing solutions, a redesign of some strategic street-links, a new multifunctional station area and better services for families and young people as well as elderly people with green facilities that allow opportunities for all to actively enjoy them, many short-term and “software” ideas could be implemented already in the next two years. Some of the proposals for actions to be implemented in the short term included ideas for changing the speed limits to balance car and pedestrian traffic, activating the ground floors with pop-up spaces for young people, activating key areas with street art and lights, providing better and more interactive information through apps and online platforms, fostering public transportation through focused pilots (e.g. a free bus card trial), and installing free wi-fi points and electric sockets for charging phones and laptops in open spaces in order to enable the possibility of spending more time outdoors whether for work or play. The Future Vision for the Seinäjoki Centre is a process commissioned and developed by the Urban Planning Department of Seinäjoki City in collaboration with OOPEAA Office for Peripheral Architecture – Seinäjoki and Gehl – Copenhagen. 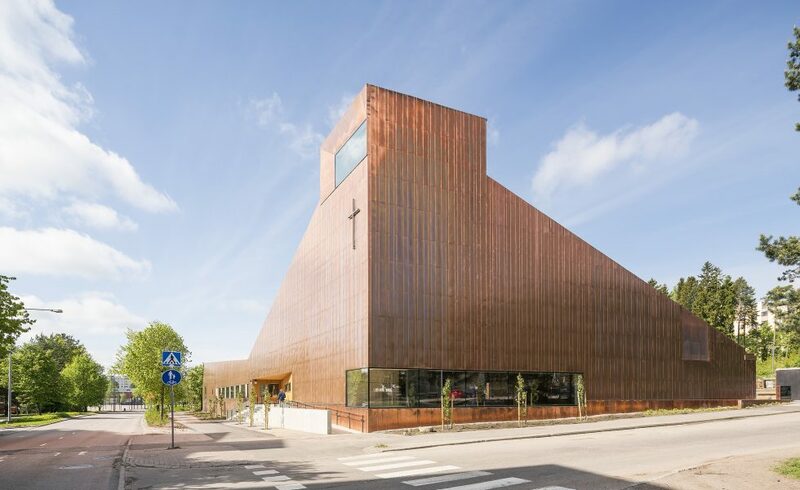 The open architecture competition for the new Ylivieska Church was organized by the Ylivieska parish and it was open to participants in Finland and the rest of the European Union. The assignment was to design a new church to be built after the old wooden church from 1786 was lost in a fire in 2016. The competition site is located in the center of the town of Ylivieska in a landscape of cultural and historical value by the Kalajoki river. OOPEAA’s entry ‘Kooda’ received a shared third place in the competition. Out of a total of 214 entries, seven were nominated for prizes: in addition to one winning entry, two entries received a shared third place and four received honorary mentions. No second prize was awarded. A total amount of 75 000 euros was given out to the winners in shares varying according to placement. The assignment was to create a functional concept of high architectural quality for a church building and a parish hall that works well in harmony with the surrounding landscape and offers potential for further development of the area while also serving as a landmark for the town. In addition to designing a new church that resonates with the tradition of Christian church building, the competition assignment also included the task of addressing the surrounding landscape with the ruins of the burnt down old church, the graveyard for war heroes and the parkland around the church. The assignment also asked to take into consideration the traffic arrangements serving the needs of the visitors as well as maintenance and service needs for the church and the parish. Kooda, the entry by OOPEAA was judged by the jury to manifest a high level of professional quality with its simple and strong church building with a saddle roof and a tall, sharp and slender belfry standing on pillars. 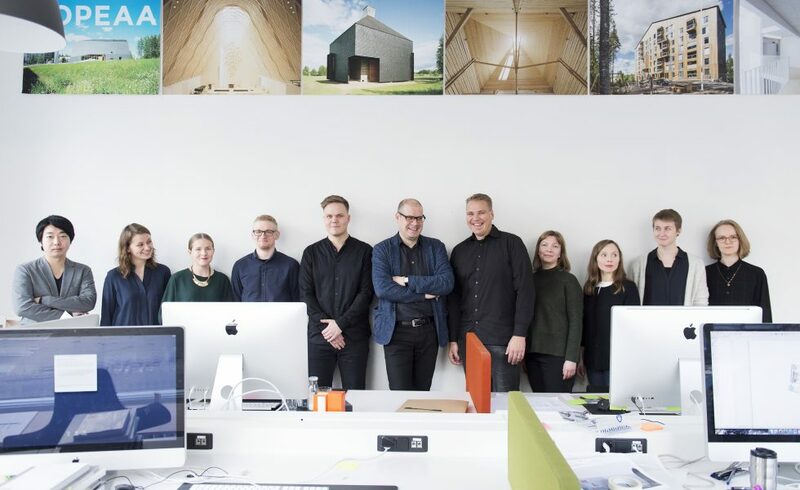 The jury for the competition was composed of six representatives of the parish as well as four architects, two of them nominated by the Finnish Association of Architects. 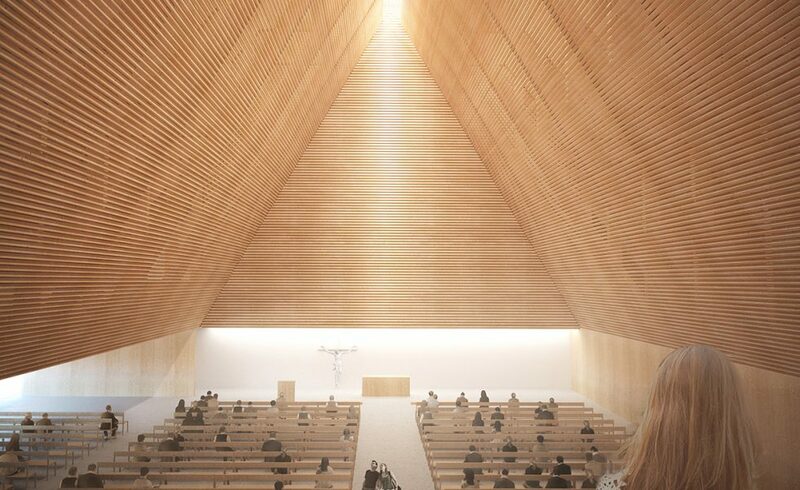 For more information on the competition for the New Ylivieska Church, see – place a hyperlink to the competition documents here. For more information on Kooda, the competition entry by OOPEAA, see the project description here.